3 Bedroom Semi Detached House For Sale in Huntingdon for £275,000. 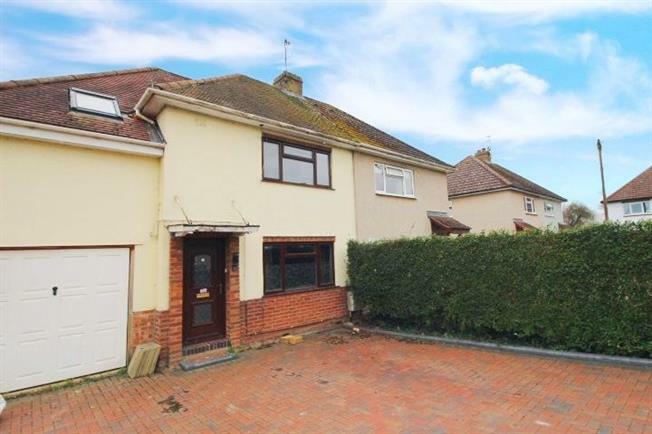 NO UPWARD CHAIN This very WELL-EXTENDED SPACIOUS three bedroom semi-detached property in the sought after area, only approximately 16 miles away from Cambridge and 5 miles from the popular market town of St. Ives, offers more than initially meets the eye. It's peaceful location within the beautiful village of Earith is complimented by generous space both internally and externally. In brief the property comprises spacious contemporary kitchen/diner finished to a very high standard with a rear patio door leading onto the enclosed garden, a very generous sized lounge and a downstairs toilet. The upstairs benefits from a charming master bedroom with a spacious en-suite, good size second and third bedrooms and a family bathroom. One of the many benefits of this beautiful home is the large rear garden with a wooden patio running along the back of the property with a base for a hot tub. This must-view house also benefits from a single garage and a very large driveway. Front door, opening onto the driveway. Tiled flooring, painted plaster ceiling. UPVC French double glazed back door opening onto the patio. Double glazed uPVC window facing the rear of the property, overlooking the garden and skylight windows. Radiator, wooden flooring, painted plaster ceiling, ceiling light. Roll top work surface, fitted units, stainless steel sink, double oven, gas hob, stainless steel extractor, integrated dishwasher, space for fridge/freezer. Double glazed uPVC window facing the front of the property. Radiator, wooden flooring, painted plaster ceiling, wall lights and ceiling light. Radiator, tiled flooring, painted plaster ceiling, ceiling light. Standard WC, wash hand basin. Carpeted flooring, painted plaster ceiling. Skylight windows. Carpeted flooring, a built-in wardrobe, painted plaster ceiling, ceiling light. Double bedroom; double glazed uPVC window facing the front of the property. Radiator, laminate flooring, built-in storage cupboard, painted plaster ceiling, ceiling light. Double bedroom; double glazed uPVC window facing the rear of the property, overlooking the garden. Radiator, laminate flooring, painted plaster ceiling, ceiling light. Double glazed uPVC window with frosted glass facing the rear of the property. Tiled flooring, part tiled walls, painted plaster ceiling, ceiling light. Standard WC, jacuzzi, pedestal sink. Double glazed uPVC window with frosted glass facing the rear of the property. Vinyl flooring, tiled walls, painted plaster ceiling, ceiling light. Standard WC, corner shower, pedestal sink.